There’s no denying that a bright, white smile is a sign of confidence and attractive to both guys and gals. Rather than hiding your smile from the world, consider investing in an electric toothbrush that takes the hard work out of cleaning for you. 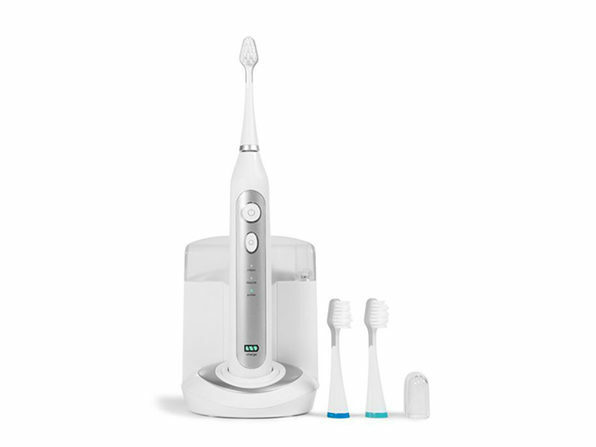 With the Platinum Sonic Toothbrush & UV Sanitizing Charging Base With 2 Bonus Brush Heads, get everything you need to take better care of your teeth and gums while doing less work. This teeth-cleaning kit sets you up for a healthy and confident smile. To kick things off, you’ll get a silver-colored platinum sonic toothbrush that packs a whopping 40,000 strokes per minute. Couple that with area change alerts and a smart timer that let you know how long to brush every part of your mouth, and you’ll eliminate plaque and polish your teeth in no time. Plus, thanks to its UV sanitizing base, you can clean with confidence since brush head germs and bacteria are wiped out between brushings. On top of that, this kit — which includes two bonus brush heads — is convenient to use. Choose from clean, dazzle, and pulse brushing modes to zone in on the care that best suits your needs. What’s more, you can use the brush for up to two weeks on a single charge, making it great for at home and travel purposes. Get it for 80% off at $49.99 in The Daily Caller Shop. You can find even more great deals like this at The Daily Caller Shop.